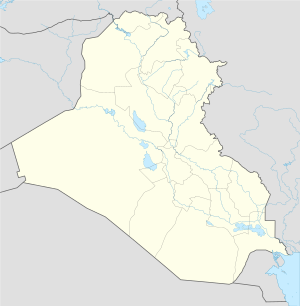 Faysh Khabur (Syriac: ܦܝܫܐܒܘܪ, Arabic: فيشخابور‎) is the Iraqi town of Pesh Khabur ("pre Khabur" in Kurdish--it is named after a smaller counterpart river to much larger Khabur River to its west inside Syria) on which the town is built. In addition to Kurds, there is a large Assyrian community in the strategic town, located on the confluence of Pesh Khabur River with the Tigris. Along with the Dohuk Governorate in which it is located, town of Pesh Khabur is under the Kurdish Regional Government jurisdiction, in Northern Iraq on the Turkish borders. The town is famous as a main crossing point to Syria and Turkey lying just 4km from the tripoint of the three countries. Faysh Khabur is inhabited by Assyrians who mainly belong to Chaldean Catholic Church. The town has been connected with the Sassanian city "Peroz-Shapur", and the modern name is thought to be influenced by the Persian one. The first mention of the settlement is attested as far as the 4th Century A.D. It was early Christianised and belonged to the Church of the East before following the Chaldean Catholic Church in the 18th century. The town was attacked by Kurdish irregulars allied with the Ottomans during the Assyrian Genocide which left hundreds dead and forced the rest to flee to Mosul and Alqosh. Most of its inhabitants returned to their village during the British Mandate for Mesopotamia. A number of its Assyrian inhabitants were attacked by the Iraqi Army during the Simele Massacre in August 1933. The village was targeted again during the first Kurdish rebellion by the Sindi Kurdish tribe first and later by the Iraqi Army, this forced the inhabitants to seek refuge in Khanik, another Assyrian village across the border in Syria, until 1975. Faysh Khabur was again emptied by the Iraqi government in 1976 when the Baathist government expelled its Assyrian population and settled Arabs in the village. Most Arabs settlers left after the 1991 uprising, and Faysh Khabur was this time occupied by Kurds from neighbouring villages. Those were finally relocated and the village was resettled by its Assyrian inhabitants in 2005. Fhaysh Khabur is today a part of the Kurdish autonomous region. ↑ 1.0 1.1 بيداويد, يوحنا. بمناسبة اعتراف برلمان السويدي بمذابح سيفو، ماذا حصل في فيشخابور وسهل نافرويي سنة 1915 (in Arabic). الحوار المتمدن. Retrieved 25 March 2012. ↑ 2.0 2.1 مبروك فيشخابور (in Arabic). Zowaa.org. Retrieved 25 March 2012. This page was last modified on 15 April 2015, at 21:57.